The #MuteRKelly Movement Takes Its Protest To The Steps Of His Record Label In the wake of the docuseries Surviving R. Kelly, protesters brought more than 200,000 petition signatures on Wednesday to RCA Records and Sony Music Entertainment, calling for the label to drop him. Protesters in the #MuteRKelly movement gather outside the Sony offices in New York City. 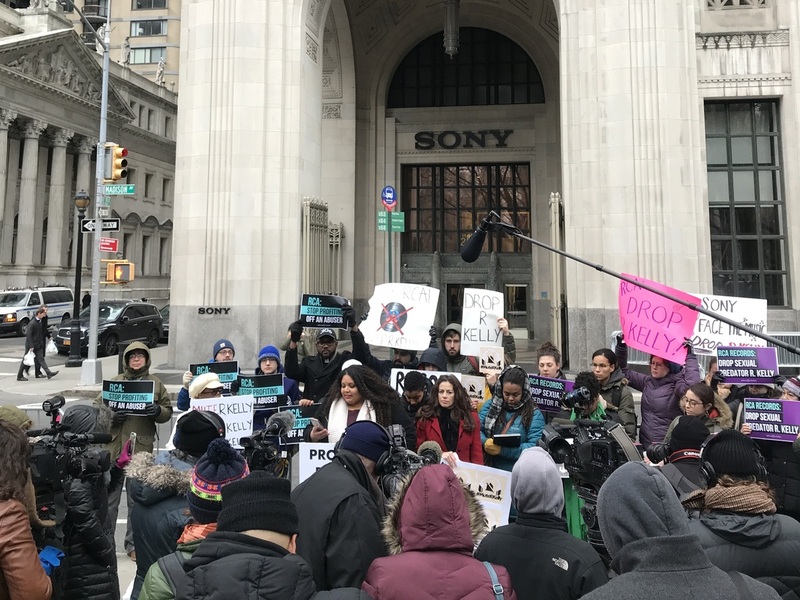 This morning, protesters gathered outside the headquarters of Sony Music Entertainment in Manhattan to demand that the company drop R. Kelly from its roster. The protest was the latest development in a long saga of accusations against Kelly that he has sexually and physically abused young women for more than a quarter of a century. Outrage over the allegations erupted earlier this month following the six-part Lifetime TV docuseries, Surviving R. Kelly. "He preyed on young black girls and RCA Records is complicit in this," says Natalie Green, one of the protest organizers. "They promoted an abuser they allowed him to line his pockets to make royalties to go on tour and thus expand his fan base. And with that fan base he was able to abuse more girls. RCA Records has helped normalize violence against women." Green's claim that R. Kelly used his star power to elicit young women from his fan base was a common argument made throughout the Lifetime docuseries. Last Thursday, Lady Gaga apologized for a 2013 duet with Kelly and had it removed from streaming services. Other artists like Celine Dion and The Pussycat Dolls have also reportedly asked for their recorded collaborations with the R&B singer to be pulled down. (Celine Dion records under Epic Records, a label also owned by Sony.) On Thursday, Interscope Records, the label of The Pussycat Dolls, confirmed to NPR that it is in the process of taking down the group's 2008 song "Out of This Club," which featured Kelly and rapper Polow Da Don. The protesters delivered what they said was more than 200,000 petition signatures urging the label to drop Kelly. RCA Records did not respond to NPR's request for comment. Jade Magnus Ogunnaike, one of the protest organizers, says that RCA Records has enhanced a very specific image of Kelly. "They've intentionally publicize this image of him where he brands himself as the Pied Piper, right? Where he's singing songs like 'Keep it on the down low,' Ogunnaike says. "Songs that are, if you listen to them after watching Surviving R. Kelly, you're just very disgusted, like 'Oh, my God. He was talking about underage girls the whole time.'" The protesters say that they will continue their campaign — including at the upcoming 2019 Grammy Awards.